December meeting on Second Monday. 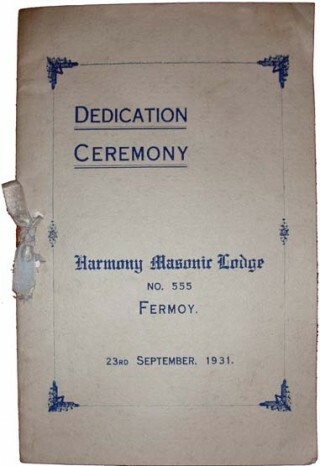 This historical summary is taken from ‘The Early Years of Harmony Masonic Lodge No. 555 Fermoy, Co. Cork (1806 – 58), compiled from the original minutes by Bro. J. Heron Lepper’, compiled during 1928 and published in AQC (1938). At this period, a peculiar privilege was still being exercised by the Provincial Grand Master of Munster to which has been given the convenient name of ‘The Munster Custom’. When the Warrant of a Munster Lodge that had become extinct, or even in some cases merely dormant, fell into the hands of the Provincial Grand Master, he might re-issue this document to a body of regular Masons and authorise them to meet as a lawfully constituted lodge in any place under his jurisdiction. An endorsement on the original Warrant stating the new place of meeting and signed by the Provincial Grand Master was held to legalise the transaction; and though the Grand Lodge in Dublin might not be informed of the re-issue till years after the event had taken place, it never refused to acknowledge the regularity of any Munster lodge that had been established in this way, (as was also Hibernian Lodge No. 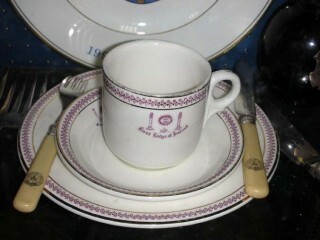 95, established in Cork during 1750). Towards the end of the eighteenth century, under the active rule of Grand Master Donoughmore, the Grand Lodge began to enforce discipline on its subordinate lodges as never before – and also, improved means of communications with the metropolis made it unnecessary to allow Provincial Grand Masters in the south the exercise of such far-reaching powers. But nothing is as tenacious of life as a custom, and the year 1801 saw one of the very last instances of it, the establishment of the extinct Carlow Warrant as an entirely new lodge at the newly developing garrison town of Fermoy, in north Cork. Lodge No. 555, of Fermoy, was opened first in that town in the year 1801, where it has remained ever since, preserving a happy mediocrity, neither too high nor too humble. The writer of these tracts served as Master twice, and was selected a third time, but from circumstances did not accept the honour. 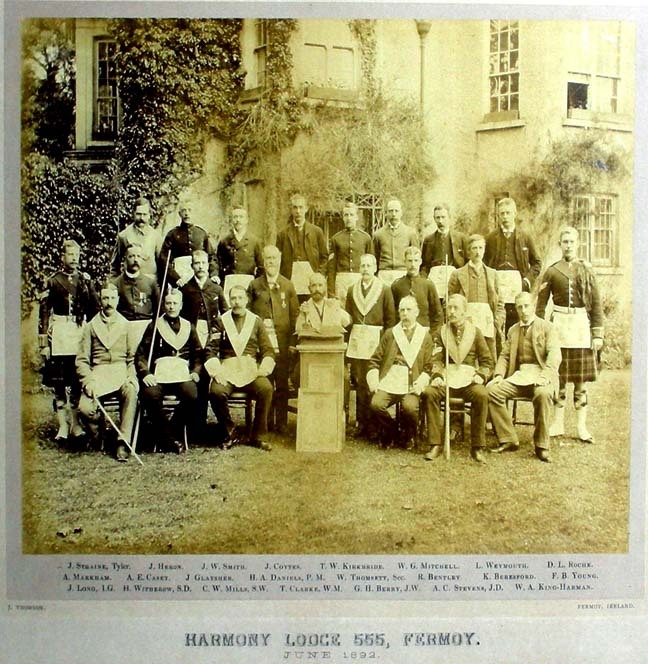 This statement is the more important because the new lodge at Fermoy was not registered with Grand Lodge of Ireland until 10 April 1809 – which is the year wrongly ascribed to its constitution in the Irish Calendar. Although this is the date of the lodge’s registry in the official records, this belated insertion must be ascribed to the inadvertence or carelessness of the Deputy Grand Secretary. The existence of the lodge was undoubtedly known in Dublin several years previously, for in July 1804, the widow of Brother Crawford of No. 555 was relieved with £3 8s. 3d. (Three guineas British money) by the Grand Lodge. No Crawford appears among the names registered to the Carlow No. 555, and the authorities in Dublin must have learnt then, if not before, of the existence of the new No. 555, meeting at Fermoy. Alexander Seton, the D.G.S. of the period, was too busy just then with other occupants to trouble over much about promptly inscribing in the Rolls a new Munster lodge from whose establishment he had received no monetary advantage. Though registered at last in 1809, Lodge 555 does not figure in the list of new warrants given in the Grand Lodge circular covering December 1809 to June 1811, nearly all of which were revivals; not yet in the list of Seton Warrants confirmed free of charge on 15 January 1810. Lodge 555 is not credited with any payment of fees for the warrant, or annual dues, in the Grand Lodge records, up to the end of 1813. We are therefore justified – in the absence of positive evidence to the contrary – in assuming that the lodge was regularly at work some time prior to 1804, and that it had paid for its warrant through the proper channels, in this case the Provincial Grand Lodge of Munster, prior to the date when Seton began to increase the emoluments of his office by a dishonest sale of revived warrants. There follows a list of those members and visitors present, and their subscriptions paid. At the above meeting the Petition of Js Camphbell Serj. 23rd Lt Drags was received and ordered to Lie over until next meeting. Lodge clos’d in Harmony at Ten O’Clock. By June 1806, the principal officers of No. 555 were attending Provincial Grand Lodge as a matter of course. In November 1809, Brother Robert Millikin (author of the Tracts) is first listed as a member of No. 555. A minute of November 1812 records Grand Lodge of Ireland regularising the payment of dues from 555 to Dublin (instead of to PGL in Cork, as previously). 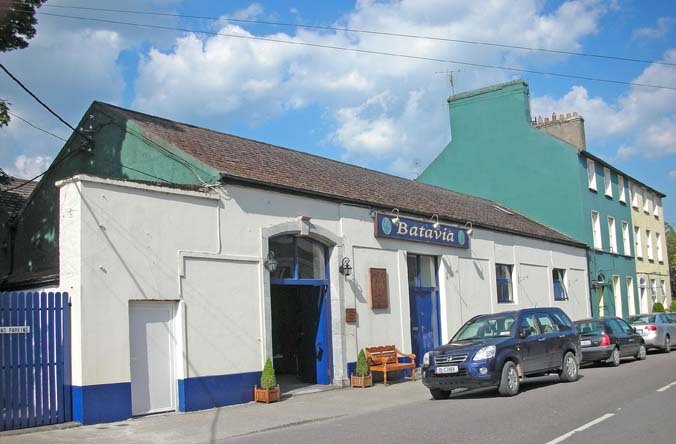 The lodge met every month of the year in a lodge room in the town of Fermoy, by 1806 at the premises of Brother Henry Sandham, then from 1813 at Br Robert O’Hara’s in Patrick Street. During 1826, the meeting moved to the King’s Arms Hotel in Queen’s Square (renamed Queen’s Arms Hotel in 1838, on the accession of Victoria), which was kept by Br Samuel Robinson, where it remained, with one short interval, until after 1858. In October 1838, it was unanimously resolved that the lodge be moved from this Hotel (Queen’s Arms) to a private house, but the November meeting is still headed ‘Kings Arms Hotel’. The next minute, dated February 1839 is headed ‘Masonic Hall, Fermoy’, location unknown. No meeting was held between March and December that year, when lodge met in Browne’s Hotel. The meeting returned to the Queen’s Arms in June 1840. In 1842, the premises was renamed the ‘Commercial Hotel’, still under the ownership of Br Robinson. From 1855, lodge met at Br William Flynn’s house, which seems to have been an Inn. During the 1860’s, the lodge moved to premises on the Rathealy Road (see photo), where a covered corridor led to the lodge room at the rear, and this remained the lodge meeting rooms while at Fermoy. Owing to the Great Irish Famine and related social change, lodge met intermittently during 1848 and in November 1850, after a hiatus of almost 2½ years without a meeting, the warrant was returned to Grand Lodge, until restored sixteen months later, on 30 March 1852. The revival was greatly assisted by English brethren and a member of the First Lodge of Ireland, both of which would aid this lodge on several future occasions. Lodge was again dormant between March 1853 and December 1854. Up to 1861, the lodge was simply known as No. 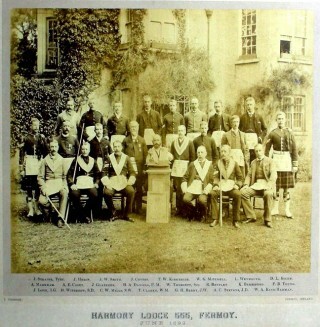 555 until, in that year, the title ‘Harmony Lodge No. 555’ was adopted. 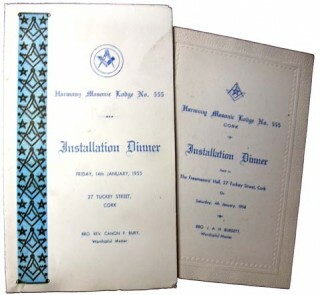 From 1829, the minutes become more explicit, and show the lodge was accustomed to opening in whatever degree of Masonry best suited to the business of the evening. Ordinary business was usually transacted in the third degree. The minutes show that Lodge 555 continued this practice right down into the early twentieth century! Nowadays, the only Irish lodge having right of opening in the third degree is that of the Grand Master, in Dublin. In 1885, on the death of Canon Arundel Hill – a lineal descendant of Br Arundel Hill who was present when Elizabeth St. Leger was made a Freemason at Doneraile Court – his widow gave to No. 555 a picture of the Hon. Mrs Aldworth, the Lady Freemason, which was hung in the Lodge Room as a memorial to her husband, their late chaplain. In 1922, with Irish independence and the removal of the military garrison, the lodge lost the majority of its membership, and gradually went into decline. An accidental fire during June 1929, which spread from adjoining premises, was a further setback, resulting in the loss of the warrant, regalia, furnishing and wall hangings. Thankfully, the records were held at the secretary’s home. For over two years, meetings were held in the disused quarters of the head groom at an old country house about three miles from Fermoy until September 1931, when the old premises was rededicated and reopened. 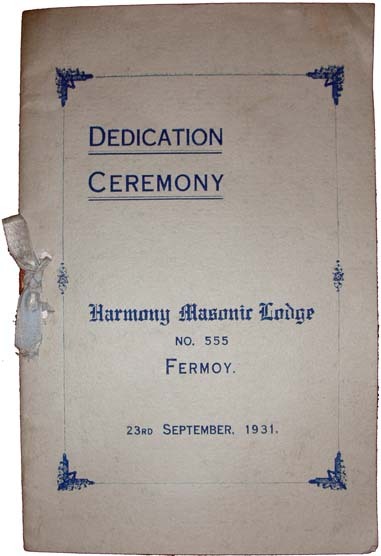 The brethren continued to meet there until 1953, when the decision was taken to remove to Tuckey Street, Cork, and on 17 February 1954, following a short trial period, permission of Grand Lodge was granted. From its removal to CORK until 2005, the lodge met on a Saturday night, to cater mainly for those who were away from home during the week. Changing work and social practices resulted in the meeting changing to its current Monday night, with effect from the beginning of 2006. In 1994, a member of Harmony No. 555 commenced weekly coffee mornings at The Masonic Hall, Tuckey Street, Cork, with the dual aim of raising money for charity and providing a venue where new people can be introduced to the craft. Coffee mornings take place every Friday between 10.15 am and 11.45 am in Freemason’s Hall, Tuckey Street, and are open to masons and non-masons alike. Just ring the bell, and you will be made most welcome! Over 30 years ago , another member of Harmony No. 555 initiated the annual Christmas party for residents of the Cheshire Home in Cork. In 1984, a member on his way to a lodge meeting rescued a dog from a railway line and tied him to the stairs for the duration of the meeting. Alas, when the meeting had concluded, the attendance discovered that the dog had chewed his way through half of the overcoats left hanging in the hall, and to this day, animals are forbidden from entering Freemason’s Hall! During the majority of its years at Fermoy – particularly from 1801 to 1922 – a considerable number of the membership were in the military garrisons of the town. In October 1835, the last recorded duel to take place in Ireland was between two military members of Lodge 555. Their dispute was on a personal matter, and was condemned by the Lodge. Each fired one round each … and both missed! The duelists were afterwards reconciled. The first mention of the Royal Arch at Fermoy comes in 1814, when a new affiliate lodged his certificates during his stay at Fermoy. Up to 1863 in this lodge – as throughout Ireland – the degree of Past Master was essential to exaltation into Royal Arch, and was thus conferred on many who had never been master of their lodge! There is no evidence in the minutes of the conferral of the Royal Arch degree on any member of No. 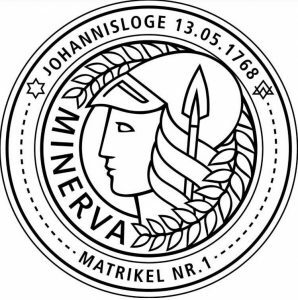 555, prior to 1829. The first record of a Royal Arch Encampment at Fermoy comes on 23 April 1834. Royal Arch Chapter 555 was first warranted in 1836. At the reverse end of our second minute book are contained some minutes (1836–41) and the warrant was still active in 1855, when it was resolved to pay off ‘the debt due on the red and blue warrants (£5)’. This warrant must have become extinct shortly afterward, as a new chapter warrant was issued in 1863, which continued to work at Fermoy until 1953. In 1961, the warrant was transferred to Drumcree, nr. Portadown, Co. Armagh, where it still works to this day.